The GP2Y0D805 and GP2Y0D810 are Sharp’s smallest and fastest distance sensors, and our tiny carrier board for these sensors includes all of the external components required to make them work. With a sample rate of almost 400 Hz and a sensing distance to 5 cm (GP2Y0D805) or 10 cm (GP2Y0D810), this sensor provides an attractive alternative to shorter-range LED-phototransistor reflectance pairs and longer-range but slower sensors such as the Sharp GP2Y0A21YK0F analog distance sensor. 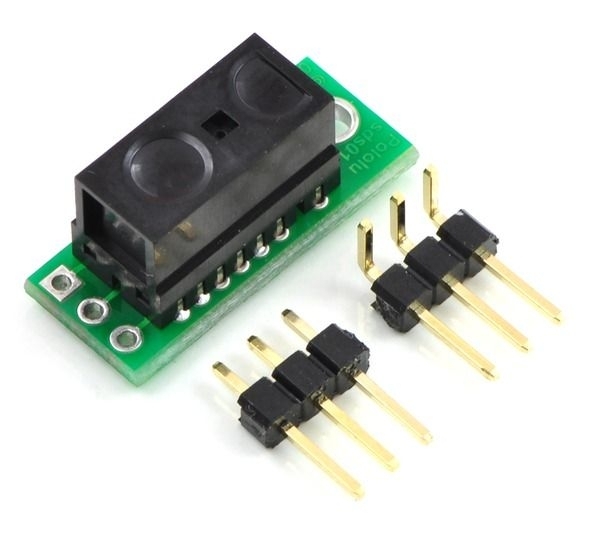 However, these sensors require external components and have a non-standard 1.5 mm pitch, which can make them difficult to integrate into projects based on a 0.1" pitch. This carrier board includes these components and provides a 0.1"-pitch, three-pin interface: ground, power, and output. Note: this product requires a Sharp GP2Y0D810Z0F or GP2Y0D805Z0F sensor (sold separately). We also offer a version of this carrier board assembled with a GP2Y0D810Z0F and a version assembled with a GP2Y0D805Z0F. You will need to solder the sensor to the carrier board so that the solder connections are made on the component-side of the board and the sensor package presses against the component-free side of the board. 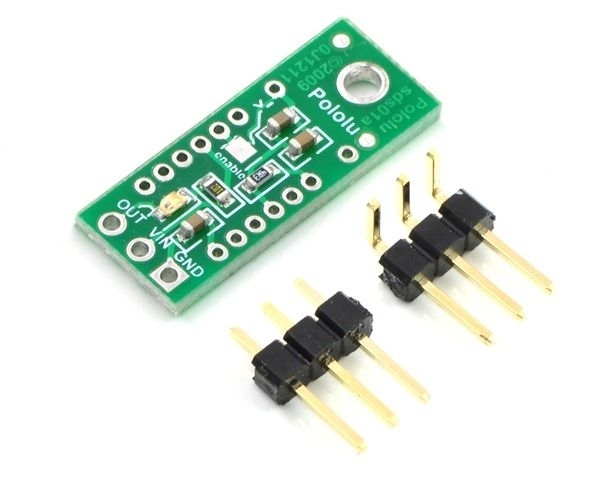 Once the sensor is soldered in, the Pololu carrier board lets you interface with the GP2Y0D810 or GP2Y0D805 sensor using a three-pin 0.100" connector, such as the included 3×1 straight male header strip and 3×1 right-angle male header strip. You can connect to these pins with a servo cable or with a custom-made cable using pre-crimped wires and a 3×1 crimp connector housing. The GP2Y0D810Z0F and GP2Y0D805Z0F have an optional enable input that can be used to put the sensor into low-power mode. 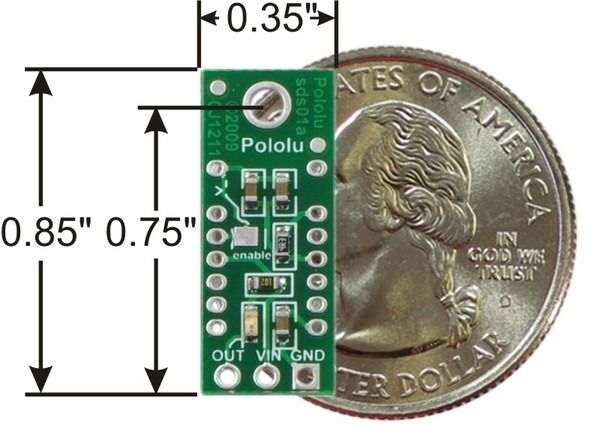 The Pololu carrier board connects this input to Vcc so that the sensor is always enabled, but you can solder a wire to the pad labeled “enable” on the back of the PCB if you want control over this input. Note that you will need to cut the trace that connects the enable line to Vcc on the PCB if you want to be able to disable the sensor. This trace is marked on the silkscreen, and there is a caret that indicates where we suggest you make the cut. Pololu carrier for Sharp GP2Y0D810Z0F and GP2Y0D805Z0F sensors schematic diagram.